New hardware provides major advances in speed and reliability as Intel also reveals details of full 5G-ready call. Intel has revealed a host of new modem products as it looks to accelerate the pace of 5G research and deployment across the world. The computing giant has unveiled its first family of 5G-ready multi-mode commercial modems, and also revealed it has successfully carried out a full end-to-end 5G call. Noting that it already has fingers in many 5G pies, including automotive and mobile calling as well as its modem hardware, the company provided an update on its current 5G development. Codenamed Gold Ridge, the work sees Intel's early 5G silicon already successfully making 5G calls over 28Ghz frequency, but now the company has introduced a number of new products to continue pushing this work onwards. 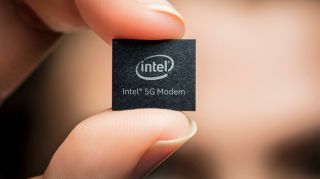 This includes the XMM 8060, Intel's first 5G commercial modem, set to begin appearing in devices around mid-2019, offering users the chance to get on board with 5G networks straight away following the expected 2020 launch. Intel also revealed an update to its XMM LTE modem line, signifying an upgrade on the XMM 7460 model currently being used in the latest iPhone devices from Apple. The new XMM 7560 and XMM 7660 products look to offer faster and more reliable mobile networks than ever before, with the former hailed as Intel's first global LTE modem, meaning you should never struggle to stay connected, wherever you are in the world. The latter offers connectivity to Cat-19 networks, and supports download speeds up to 1.6GBps, making it Intel's fastest LTE modem to date. “Today’s wireless networks are the equivalent of data driving down a single-lane highway; tomorrow’s will need to serve as a multilane superhighway as data moves at warp speed with 5G networks,” said Sandra Rivera, Intel senior vice president and general manager of the network platforms group.